*There are four copies in the above image because one would have looked weird. 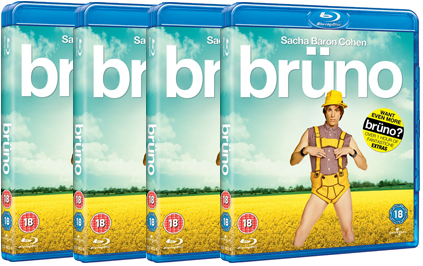 I watched Brüno again at the weekend and I stand by having it on Best of 2009, albeit pretty near the bottom of the list. It’s still one of the funniest movies of the year, and Sacha Baron Cohen is still the king of improvisatory character comedy (sorry ‘Le Donk’) but second time round, it’s even harder not to notice its flaws. At its best it works a lot like Borat, ingratiating Baron Cohen’s vacuous gay fashionista with a variety of unlikable real-life characters in order to expose homophobia, celebrity obsession and the idiocy of the fashion world. All too often, however, it’s simply an excuse for Brüno to go around offending fairly normal people with ludicrously OTT behaviour. This is still funny, but it’s not exactly the cutting edge of satire. Shot on digital –> Looks great. Weirdly, some of the best material (satire-wise) is hidden away in the deleted scenes. There’s some absolutely incredible stuff with an interior designer. There’s also a really really good picture-in-picture commentary from Larry Charles and Sacha Baron Cohen, in which they explain exactly how they did each scene, putting to bed all the debates about what’s staged and what isn’t.